Here it is, the bounteous swag that I obtained at the ALA Annual Convention in New Orleans this past week. Breathtaking, right? I am so amazed that I snagged so many books that I've been dying to read... items from my To Be Read list, as well as books that I hadn't heard about but look wonderful. I got the last copy of The Girl of Fire and Thorns at the booth! I got a copy of the long-awaited Super Diaper Baby sequel (already given away as a Summer Reading prize to a much delighted kid at my library), Maggie Stiefvater's The Scorpio Races, The Princess Curse by Merrie Haskell, Lauren Oliver's Liesl and Po. Yeah, I made out like a bandit. Not pictured: about 30 or 40 posters I picked up to decorate the children's area of my library with. And several dozen bookmarks. There were a few things that I had hoped to pick up, that I didn't get my hands on. I wanted a copy of Allie Condie's Crossed! But, there was a huge line for it, and I didn't have time to wait. I really wanted to get a peek at Brian Selznick's Wonderstruck, and someone tweeted when they were doing the Wonderstruck giveaway, but by the time I got to that part of the convention floor, they were all gone. Not as many tote bags this year, either. I love this READ bag which I think I got from Demco, a library supply company, but there was a TinTin bag that I absolutely lusted for and couldn't find. Rats. The feeling on the convention floor was surprisingly negative! Lots of librarians grousing that they wanted MOAR FREE STUFF. Lots of publishers charging for books that they once might have given away for free. There was even one publisher (I won't say who, but it was a small press) who was selling ARCs. They said they believed in charging for content. ARCs have come a long way. These days they look like glossy paperback editions. I remember when ARCs had no cover art, plain blue or tan covers, tons of typos and cryptic messages like "Art TK" instead of illustrations. Publishers definitely spend a lot more time and money creating ARCs nowadays. Still, I feel if a book has the words Advance Readers Copy, Not For Resale printed on it, I shouldn't have to pay money if I'm not supposed to resell the book. Although, shamefully, some people do just that, as any trip to ebay will tell you. Most publishers were having author signings with finished hardcovers selling for $5... still an amazing bargain. Weirdly, there were a lot of books there that I could have gotten, but didn't because I already had the ARC at home. I had several publishers try to push books into my hands, mostly romance novels and adult crime fiction. I politely explained that I wasn't picking up anything I couldn't use for work or my blog and they all exclaimed with astonishment how "honest" I was. Gosh! I don't know about that... but I can tell you, I do try to keep the size of my book collection to a (somewhat) reasonable level. And with my TBR list as long as it is, I certainly didn't need a copy of everything on the convention floor. I'm just grateful that I get any advance copies of books at all! What I did appreciate was that there seemed to be more authors than ever on the convention floor. It was awesome meeting so many famous writers. Authors are totally my rock stars! I liked that there were so many stages in the back of the Expo hall, with graphic novel panels and new fiction readings, and even cooking demos from cookbook authors. Overall, it was a great time. This looks like a great collection of items! 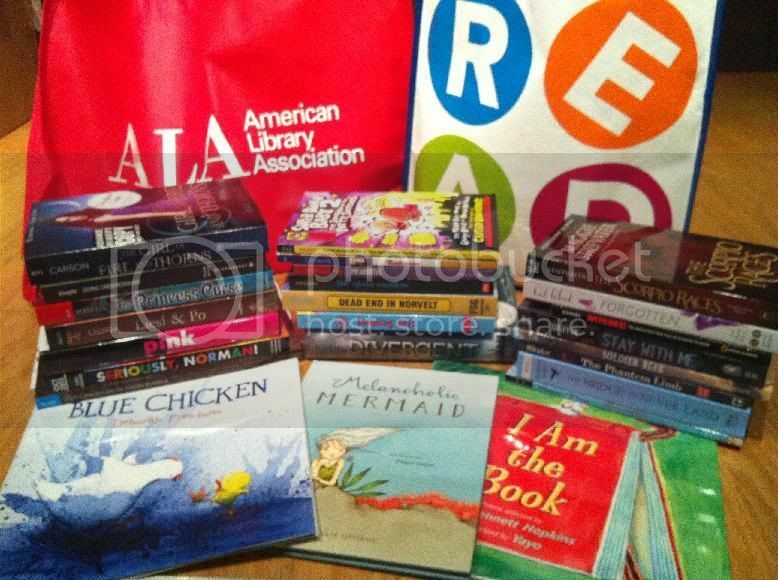 I didn't attend ALA, and it is too bad that there was negativity on the exhibit floor. I agree with you that charging for ARCs isn't a great idea (even given the sale of them on eBay and in used bookstores! ), so I hope that it doesn't become a trend with publishers. The Princess Curse and Girl of Fire and Thorns! *faints* I hope you enjoy them! Even with the negativity, it sounds like it was a great event. looks like you got some great stuff, I really want to read the 'Scorpio Races' sounds fascinating. I don't think they should charge for ARC's - they are supposed to be promotional items. bit cheeky! @booksNyarn I know it! I donate my ARCs to schools, or give them away as prizes at my library. That's the way it should be. @Smalls It's funny, every day that passes, the momentary negativity of a few seems less and less important. I really had to stop myself from shrieking with delight when I snagged Girl of Fire and Thorns. @Barmy I tried to be a bit choosy in picking up ARCs... but Maggie Stievfater was an obvious YES when I found it. You have a nice list of books that you received this week in your mailbox.